The Hänel Rotomat® is an industrial carousel storage system that uses room height to provide warehouses with up to 60% more work space. The Rotomat® protects parts from dust, light and unauthorised access, with ID/pin code entry only. The carousel storage system operates on a Ferris wheel principle, which allows the requested part or tool to be brought automatically to the ergonomic retrieval height of the user. With multiple access points on different floors, the Rotomat® ensures that there is no need for ladder climbing, bending or lifting, which significantly lowers the risk of accidents in the workplace. There are five colours to choose from, along with the option of a customised finish. What benefits can a Rotomat® Industrial carousel storage system bring to my business? Saves time using a microprocessor control system to request relevant folders. Neater storage layout, making stock taking and re-ordering quick and easy. Making all stock easily accessible for employees, with access points on multiple floors. 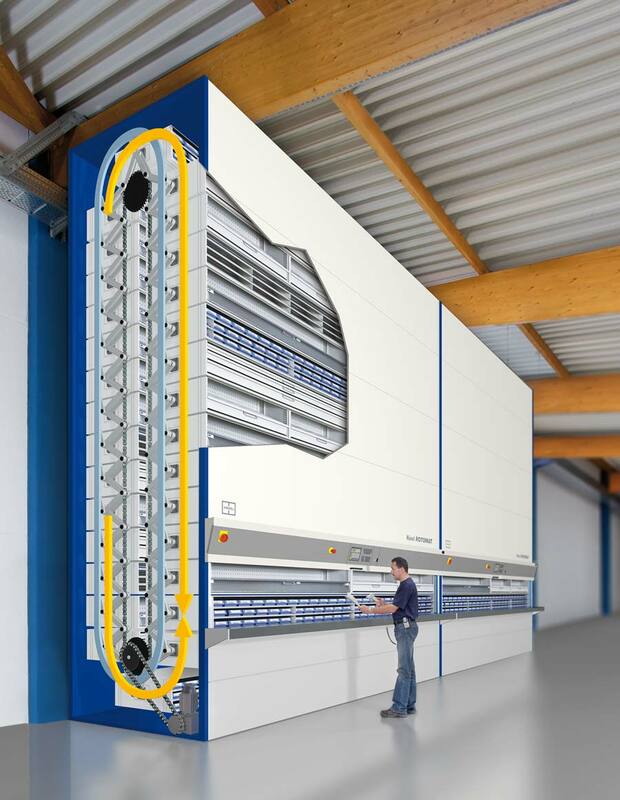 Rotomat® using vertical storage space. Equipped with twin motors to guarantee less wear and quieter running. Lockable telescopic drawers for confidentiality. Option of a fire proof door is available. Customised fittings and special purpose holders for SMT reels, cable drums, printing rollers, rods and tubes. Wide range of accessories available; plastic boxes, tool inserts, molded trays for small parts and holders for milling cutters, turning the Rotomat® into a complete logistics system. Long lifecycle and high load-bearing capacity up to 750kg/1,652 lbs per carrier, depending on the model.